Gothic Arch Greenhouses offers a complete range of grow light systems that feature grow light ballasts and reflectors in easy-to-install and operate packages. Specializing in gardening supplies,indoor gardening, greenhouse, aquaponic and hydroponic gardening supplies. 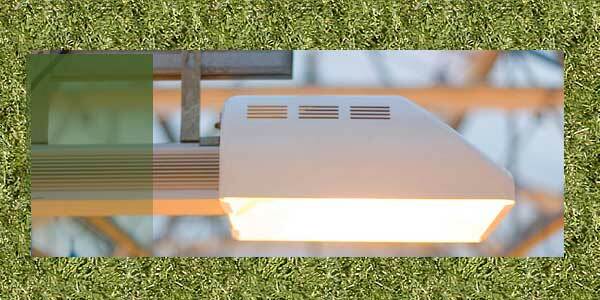 HPS 150 Grow Light Fixture: This compact easy to use light fixture will work great for any gardener. The high intensity bulb delivers an amazing 16,000 lumens and provides the output and ideal color spectrum required for successful indoor gardening. Grow herbs, flowers or fresh vegetables all year, not just in summer. 150 watt high pressure sodium bulb (mogul base) included. Highly reflective aluminum insert. Vented housing helps dissipate heat. Durable white powder-coated finish. Backlit on/of switch. 7 ft grounded 120 volt power cord. Dimensions: 15 in long x 9-1/2 in wide x 3-3/4 in high. One year warranty on lamp. SL 125 Fluorescent Fixture with Lamp: This fixture includes everything you need to get growing. It starts with a high quality 125 watt Feliz™ fluorescent 6500°K grow lamp. Add a White Wing Reflector that has a bright white powder-coated finish providing excellent reflectivity and durability. It has a sturdy steel construction for long life and a heavy duty socket assembly. Includes mogul base socket and 8 ft 120 volt power cord. Integrated mounting bracket with wire hangers for hanging the fixture. Just plug in and start growing. 6 month warranty on lamp.